A triathlon involves three sports: swimming, biking, and running. It gives you a whole body workout, strengthening all muscle groups in your body and takes stress off of one particular area; thereby reducing the risk of injury. If you are ready to challenge yourself, train in a multi-sport sport, and expand your comfort zone, a triathlon is for you! Take the first step towards your goal! Our seasoned coaches and mentors have completed several Triathlons, including the Ironman distance. They train, guide, and support athletes in every training session. Our training program provides the rigor and structure to build and grow endurance that you can take forward well past any race. From core strengthening, bike spin, and open swim sessions, you will receive the guidance and the motivation needed to compete and achieve your goal. Nutrition Clinics, Shoe Fitting Clinics, Bike Clinics, Bike Flat Fixing Session, Master Swim Programs. Team Asha will direct you to additional resources that will make you knowledgeable about the sports that you are pursuing. 20 athletes completed their first triathlon! The program is completely driven by a bunch of volunteers who are passionate about the cause of Asha for Education. All our coaches, mentors and coords volunteer their time to make the program successful. 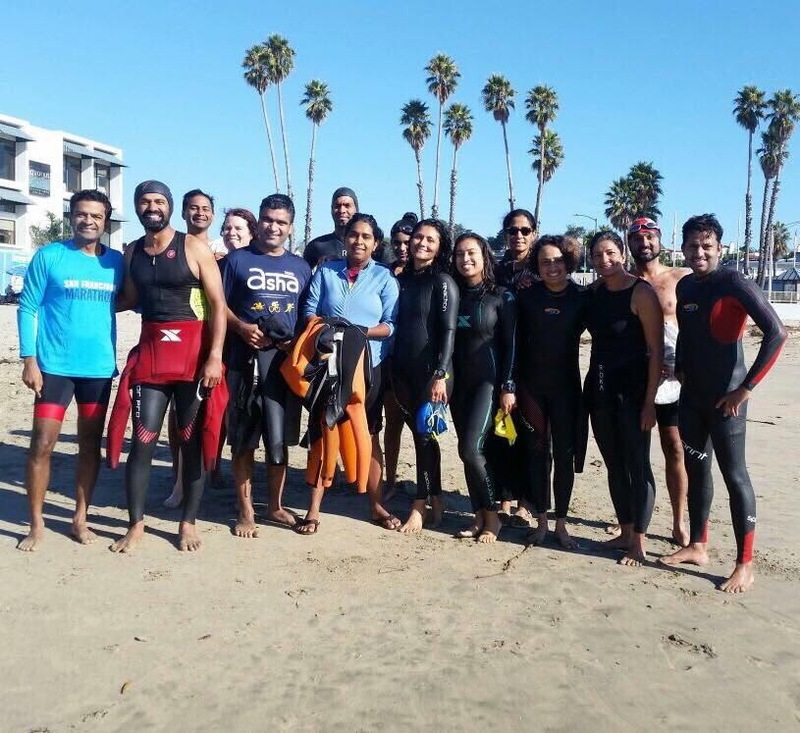 Team Asha athletes raise funds for Asha for Education, Silicon Valley chapter, which helps support education initiatives for underprivileged children in India. In 2018, Team Asha Triathlon program raised ~ $44K. Extensive weekday and weekend training plans. Open Water Swims will be on Saturdays and Long Ride & Run brick workout will be on Sundays. Track workouts help you improve your running speed. Spin sessions help you with biking. We will have it once a week on one of the weekday evenings in South Bay. Come talk to the coaches and coords to learn more about the program. Registration to the Team Asha programs is NOT mandatory to attend the kickoff. If you are worried about committing to the program, we invite you to the first two weeks which are open to all without a need for enrollment or a commitment to fundraise. By 4th weekend, you would be required to ‘recommit’ to our program: a commitment to finish your fundraising target as per our deadline. All the money raised through this program gets distributed among 20+ NGOs that we work with across India. Deenabandhu Mobile Science Van: School goes to your doorstep! To learn more about our projects and locations, please visit http://sv.ashanet.org/projects/. Asha for Education is a 100% transparent and volunteer driven organization. Every single $ you raise is dispersed to our projects. All the coaches train athletes for no cost and in fact many of them fundraise just like any other athlete enrolled in our program. In 2018, our Team Asha athletes raised ~300K. Asha for Education Silicon Valley chapter dispersed 565K to 20+ projects impacting the lives of 28,000+ children in India. Check out our 2018 annual report here. Start your fundraising early – this helps in reaching out to more people and raise way more than your minimum target. Most of the profit companies in the Bay Area do company matching. All your donations can be doubled by applying for company match. Check here if your company has a donation matching program. Every single hour you volunteer for ANY NGO can be used towards your fundraising through ‘volunteer hour grants’. Another great way to fundraise is to organize a lunch sale at your workplace or in your friends circle. You also get a chance to explain about various projects Asha supports. Read this article to see how a Alumni raised funds. Lose your inhibitions – you are asking people to donate for a great cause. It’s important to explain why you are training through Team Asha and how proud your donors should be because they are helping every child in leading a better life! If you are artsy & crafty, this will be an amazing way to show your talent. You can ask people to donate towards your FR for every item you sell. General donations to Asha for Education by the athlete in the same fiscal year can be accounted towards FR target. (donations to fundraising campaigns such as Work An Hour, Support A Child etc and events will not be considered). Tips from our Asha alumni. Be sure to attend our fundraising clinic to learn more! I have never raised money for a cause. How do I raise 1000+ dollars? This is a very valid concern that every new member of Team Asha has. We will help you with ideas, materials, fundraising clinics etc to help you with your fundraising. During every weekend training, your group captain will help you keep on track. Till date, more than 80% of our bikers have raised more than the minimum fundraising targets. What happens if I am unable to meet my fundraising target? Team Asha mentors and other Asha volunteers will work with you throughout the program and beyond to help you honor your pledge of raising the target amount. Please see this program as a means of supporting and encouraging the underprivileged children and not simply a biking-training program. Without your fundraising efforts, it would be difficult for Asha to continue supporting these projects. We urge you to do your best to honor your commitment in helping these children. If in the end you still fail to reach the target then you are required to cover the balance by yourself. Asha for Education is a 100% volunteer driven organization. Asha-SV has a list of projects we support every year. 100% of your donation goes towards the projects because our operating expenses will be covered by the registration fee you pay. If you want to donate to a particular project of your interest, please contact sv.projects@ashanet.org. Early April 2019. Join us for a short run and stretching session. The event is FREE and registrations are not required. Meet our coaches, coords and alumni to learn more about the program. Early April 2019. Cañada Road, Redwood City, CA Join us for a short ride. The event is FREE and registrations are not required. Meet our coaches, coords and alumni to learn more about the program. Early April 2019. Join us for a short ride. The event is FREE and registrations are not required. Meet our coaches, coords and alumni to learn more about the program. April 26, 2019 – This is the last date to withdraw from the program. Anyone who continues to train beyond this date will be required to fundraise the minimum amount. What kind of commitment is expected from the triathletes? 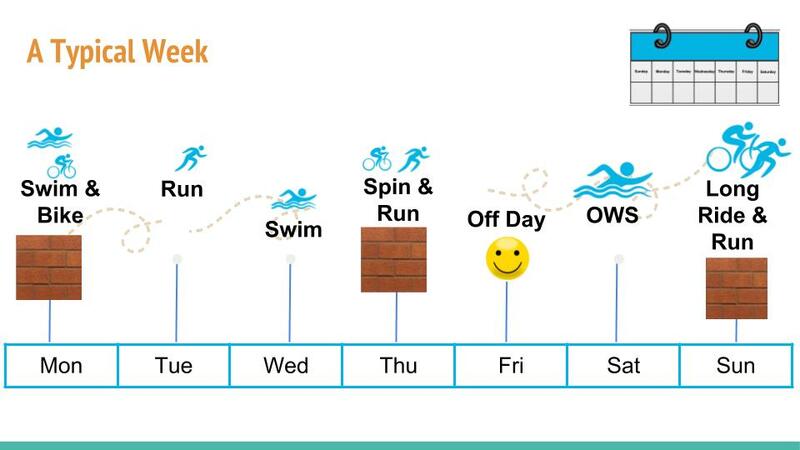 How will my week look like? Just like any other endurance event, you will need some level of commitment, the training program kicks off in April. Most of you will start pool training much before that. Our program starts with smaller endurance activities and help you build up as you approach your event date. To start with we will have Bike + Run group training on weekend, while you are swim training in the pool. We will add group open water swims to weekends around May. On the weekday evenings we will have bike on trainer and speed run exercises. What does the Team Asha training program provide? A comprehensive 5 month training program conducted by experienced coaches. Guidance on selecting a bike, apparel and nutrition. Get fit! Learn to live a healthy and active lifestyle. What Triathlon distance do we train for? When and where will the training happen? Pool swims will either be in Fremont High School or a pool in Saratoga. Open water swims mostly in Gull Park Foster city, we also make visits to Aquatic Park in SF, Santa Cruz and Coyote Point. Bike rides are mainly in the south bay. Is there a minimum fitness-level requirement? Yes, there is a minimum requirement for the swim and bike portion of the training. For biking you should know how to bike. For the swim portion by the time we get in to open water training session in May you should be able to swim at least couple of laps in the pool comfortably breathing. I have been doing regular running or biking, can I handle all 3 at once? Good news is that you are engaged in a regular endurance activity. With proper training and coaching you will be able to do all the activities. Our training program will mix these activities so that you are ready on the race day. Most of the tri- athletes have been doing endurance run or bike events prior to joining Triathlon. Do I have to sign up for all the races? No you can sign up for the ones you want to participate. Registration fee ensures your spot in the triathlon training program. All registrants get a running tshirt, biking jersey and a bike bottle. The registration fee is used to cover all the expenses for the training program, so every dollar you raise directly goes to support the education of underprivileged children in India. What other costs that I need to bear? Other costs include swimming, biking, and running gears, race registration etc. I am interested but I am not sure if I can do it. What do I do? Feel free to contact program coordinators or coaches to discuss any questions or concerns you may have. Coordinators can be reached at tri AT sv DOT team-asha DOT org. Meet us in person on March 31st at the Kickoff event at Sports Basement, Sunnyvale, attend the two open runs/rides at the beginning of the season to see how you feel during the ride.